At the end of the last long hot weekend at work I wanted something easy and delicious for dinner that didn’t need much thought. 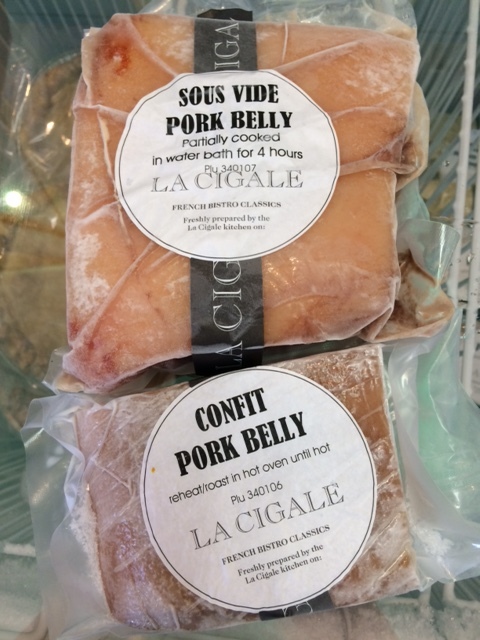 I grabbed two pieces of pork belly from our freezer of ready meals at La Cigale. Lou comes up with all sorts of things to go into the freezer ready to sell including small packs of confit pork belly and sous vide pork belly. The confit is fully cooked and simply needs to be put in a hot oven (220-240°C) for about 20 minutes or until the skin is crisp. The sous vide version is partially cooked and needs about 20 minutes in a hot oven to make the crackling and then another 30 minutes at about 160°C or until the meat feels cooked. I took a piece of each to try. Flicking through one of my recipe books yesterday, My Street Food Kitchen, by Jennifer Joyce, I found a Spanish Basque inspired recipe for a sherry vinegar and quince paste sauce to go with roast pork belly. It’s really good and I think it’d also be great as a glaze for duck breasts. 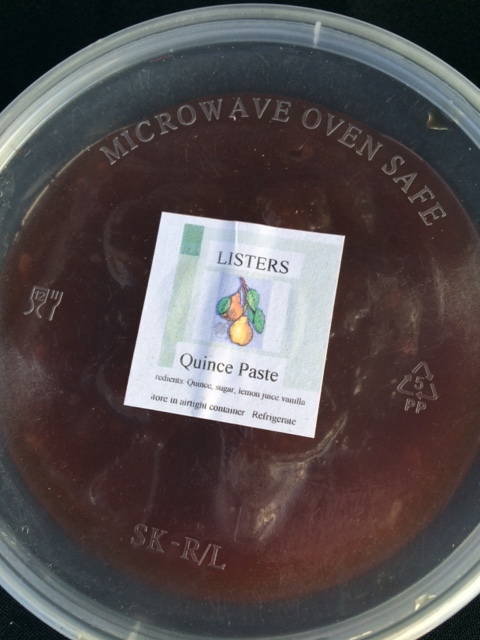 Our stallholder Terry Lister has excellent quince paste that his wife Kathy makes. 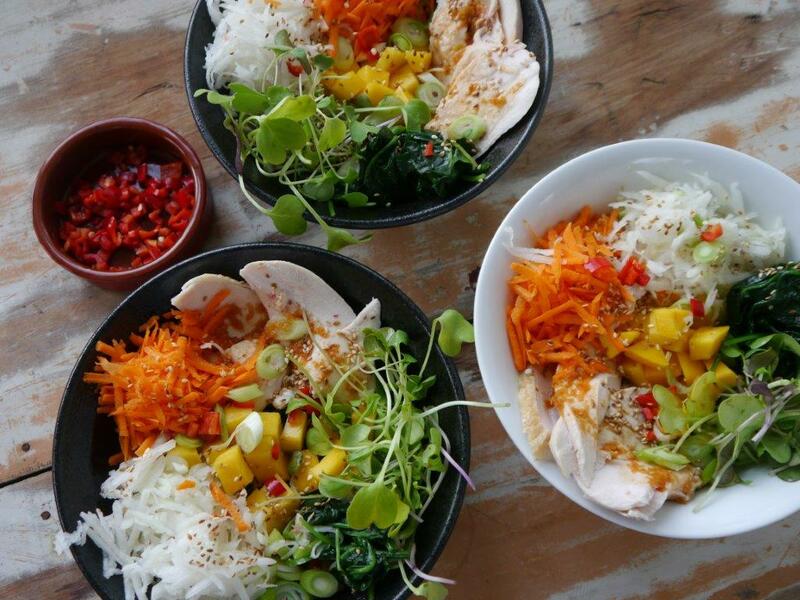 It’s also lovely with cheese. Heat the pork belly according to instructions on our packets. While that’s in the oven make the sauce. Heat the oil in a pot and gently cook the garlic till golden. Add the quince paste and stir for a minute or two till it starts to melt. Add the sherry vinegar. Keep stirring till the quince paste is nearly melted. Add the brown sugar and chilli flakes. Simmer gently for about 5 minutes. The sauce needs to reduce a little and become syrupy. Serve on the side with slices of pork belly. We ate it with a Puy lentils and a salad but any vegetable salad will work well to balance the rich deliciousness of the pork.